Served as the flagship of 2nd Light Cruiser Squadron. During the battle she relayed back the vital intelligence to Beatty that 16 German dreadnoughts had been spotted. This caused Beatty to reverse course and start the run to the North whoch eventually brought Hipper and Scheer to Jellicoe's main battle fleet. 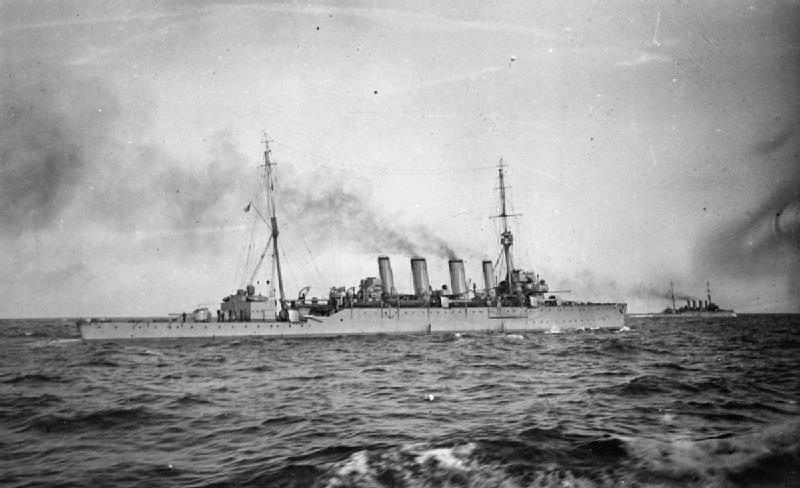 In the later actions she torpedoed the German light cruiser SMS Frauenlob (she sank later). Took 18 x 4.1" hits and 2 x 5" during the battle. Commodore William E. "Barge" Goodenough, M.V.O., A.D.C. 2 shaft, Parsons steam turbines, 12 Yarrow boilers giving 25,000m hp. A very good read of Southampton's role at Jutland can be found in "A Naval Lieutenant 1914-1918" written by "Etienne" Methuen, 1919.